BackgroundAnnually over 520,000 newborns die from neonatal sepsis, and 60,000 more from tetanus. Estimates of the effect of clean birth and postnatal care practices are required for evidence-based program planning.ObjectiveTo review the evidence for clean birth and postnatal care practices and estimate the effect on neonatal mortality from sepsis and tetanus for the Lives Saved Tool (LiST).MethodsWe conducted a systematic review of multiple databases. Data were abstracted into standard tables and assessed by GRADE criteria. Where appropriate, meta-analyses were undertaken. 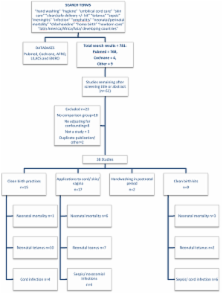 For interventions with low quality evidence but a strong GRADE recommendation, a Delphi process was conducted.ResultsLow quality evidence supports a reduction in all-cause neonatal mortality (19% (95% c.i. 1–34%)), cord infection (30% (95% c.i. 20–39%)) and neonatal tetanus (49% (95% c.i. 35–62%)) with birth attendant handwashing. Very low quality evidence supports a reduction in neonatal tetanus mortality with a clean birth surface (93% (95% c.i. 77-100%)) and no relationship between a clean perineum and tetanus. Low quality evidence supports a reduction of neonatal tetanus with facility birth (68% (95% c.i. 47-88%). No relationship was found between birth place and cord infections or sepsis mortality. For postnatal clean practices, all-cause mortality is reduced with chlorhexidine cord applications in the first 24 hours of life (34% (95% c.i. 5–54%, moderate quality evidence) and antimicrobial cord applications (63% (95% c.i. 41–86%, low quality evidence). One study of postnatal maternal handwashing reported reductions in all-cause mortality (44% (95% c.i. 18–62%)) and cord infection ((24% (95% c.i. 5-40%)).Given the low quality of evidence, a Delphi expert opinion process was undertaken. Thirty experts reached consensus regarding reduction of neonatal sepsis deaths by clean birth practices at home (15% (IQR 10–20)) or in a facility (27% IQR 24–36)), and by clean postnatal care practices (40% (IQR 25–50)). The panel estimated that neonatal tetanus mortality was reduced by clean birth practices at home (30% (IQR(20–30)), or in a facility (38% (IQR 34–40)), and by clean postnatal care practices (40% (IQR 30–50)).ConclusionAccording to expert opinion, clean birth and particularly postnatal care practices are effective in reducing neonatal mortality from sepsis and tetanus. Further research is required regarding optimal implementation strategies. Up-to-date information on the causes of child deaths is crucial to guide global efforts to improve child survival. We report new estimates for 2008 of the major causes of death in children younger than 5 years. We used multicause proportionate mortality models to estimate deaths in neonates aged 0-27 days and children aged 1-59 months, and selected single-cause disease models and analysis of vital registration data when available to estimate causes of child deaths. New data from China and India permitted national data to be used for these countries instead of predictions based on global statistical models, as was done previously. We estimated proportional causes of death for 193 countries, and by application of these proportions to the country-specific mortality rates in children younger than 5 years and birth rates, the numbers of deaths by cause were calculated for countries, regions, and the world. Of the estimated 8.795 million deaths in children younger than 5 years worldwide in 2008, infectious diseases caused 68% (5.970 million), with the largest percentages due to pneumonia (18%, 1.575 million, uncertainty range [UR] 1.046 million-1.874 million), diarrhoea (15%, 1.336 million, 0.822 million-2.004 million), and malaria (8%, 0.732 million, 0.601 million-0.851 million). 41% (3.575 million) of deaths occurred in neonates, and the most important single causes were preterm birth complications (12%, 1.033 million, UR 0.717 million-1.216 million), birth asphyxia (9%, 0.814 million, 0.563 million-0.997 million), sepsis (6%, 0.521 million, 0.356 million-0.735 million), and pneumonia (4%, 0.386 million, 0.264 million-0.545 million). 49% (4.294 million) of child deaths occurred in five countries: India, Nigeria, Democratic Republic of the Congo, Pakistan, and China. These country-specific estimates of the major causes of child deaths should help to focus national programmes and donor assistance. Achievement of Millennium Development Goal 4, to reduce child mortality by two-thirds, is only possible if the high numbers of deaths are addressed by maternal, newborn, and child health interventions. WHO, UNICEF, and Bill & Melinda Gates Foundation. Copyright 2010 Elsevier Ltd. All rights reserved. Neonatal deaths in developing countries make the largest contribution to global mortality in children younger than 5 years. 90% of deliveries in the poorest quintile of households happen at home. We postulated that a community-based participatory intervention could significantly reduce neonatal mortality rates. We pair-matched 42 geopolitical clusters in Makwanpur district, Nepal, selected 12 pairs randomly, and randomly assigned one of each pair to intervention or control. In each intervention cluster (average population 7000), a female facilitator convened nine women's group meetings every month. The facilitator supported groups through an action-learning cycle in which they identified local perinatal problems and formulated strategies to address them. We monitored birth outcomes in a cohort of 28?931 women, of whom 8% joined the groups. The primary outcome was neonatal mortality rate. Other outcomes included stillbirths and maternal deaths, uptake of antenatal and delivery services, home care practices, infant morbidity, and health-care seeking. Analysis was by intention to treat. The study is registered as an International Standard Randomised Controlled Trial, number ISRCTN31137309. From 2001 to 2003, the neonatal mortality rate was 26.2 per 1000 (76 deaths per 2899 livebirths) in intervention clusters compared with 36.9 per 1000 (119 deaths per 3226 livebirths) in controls (adjusted odds ratio 0.70 [95% CI 0.53-0.94]). Stillbirth rates were similar in both groups. The maternal mortality ratio was 69 per 100000 (two deaths per 2899 livebirths) in intervention clusters compared with 341 per 100000 (11 deaths per 3226 livebirths) in control clusters (0.22 [0.05-0.90]). Women in intervention clusters were more likely to have antenatal care, institutional delivery, trained birth attendance, and hygienic care than were controls. Birth outcomes in a poor rural population improved greatly through a low cost, potentially sustainable and scalable, participatory intervention with women's groups. Copyright statement: Copyright ©2011 Blencowe et al; licensee BioMed Central Ltd. Effectiveness of prenatal tetanus toxoid immunization against neonatal tetanus in a rural area in India. A matched case-control study of risk factors for neonatal tetanus in Karachi, Pakistan. Neonatal tetanus in rural Bangladesh: risk factors and toxoid efficacy.